I was going to try and get some actual reference for this one, but I could find none. I know I've seen some skull remains somewhere but my web-fu was not up to the challenge. Andrea Cau of Theropoda has proposed that this guy MIGHT actually be a late surviving carcharodontosaur, so I drew one up and added a quick tone. This is COMPLETELY hypothetical!! 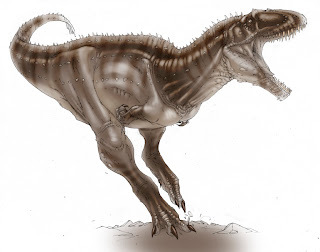 a second hypothesis (in my opinion, a bit less plausible) is that Labocania is a tyrannosauroid close to tyrannosaurids. Pending new material is discovered, we cannot say more. I was just ticked I couldn't find any skull material on line. I thought the NMMNH had it (I can swear I saw it while I was there) but I couldn't find it on there site. Hopefully my camera won't die the next time I head that way! Hi my name is Nilson live in Brazil, recently discovered the carnosauria and I was crazy with their designs. The first image I saw was the unamed carcharodontosaurus and love, you said you did the drawing of teeth due to the discovery of a possible carcharodontosaurídeo but then learned it was a abelisaurídeo. I learned that since there were so far away. I was under the impression that Labocania was a tyrannosauroid.